Salmonella is a genus of rod-shaped (bacillus) Gram-negative bacteria of the family Enterobacteriaceae. The two species of Salmonella are Salmonella enterica and Salmonella bongori. S. enterica is the type species and is further divided into six subspecies that include over 2,600 serotypes. In biology, a species ( ) is the basic unit of classification and a taxonomic rank of an organism, as well as a unit of biodiversity. A species is often defined as the largest group of organisms in which any two individuals of the appropriate sexes or mating types can produce fertile offspring, typically by sexual reproduction. Other ways of defining species include their karyotype, DNA sequence, morphology, behaviour or ecological niche. In addition, paleontologists use the concept of the chronospecies since fossil reproduction cannot be examined. While these definitions may seem adequate, when looked at more closely they represent problematic species concepts. For example, the boundaries between closely related species become unclear with hybridisation, in a species complex of hundreds of similar microspecies, and in a ring species. Also, among organisms that reproduce only asexually, the concept of a reproductive species breaks down, and each clone is potentially a microspecies. Salmonella bongori is a pathogenic bacterium belonging to the genus Salmonella, and was earlier known as Salmonella subspecies V or S. enterica subsp. bongori or S. choleraesuis subsp. bongori. It is a Gram-negative, rod-shaped bacterium (bacillus), which causes a gastrointestinal disease called salmonellosis, characterized by cramping and diarrhoea. It is typically considered a microbe of cold-blooded animals, unlike other members of the genus, and is most frequently associated with reptiles. Salmonella enterica is a rod-shaped, flagellate, facultative aerobic, Gram-negative bacterium and a species of the genus Salmonella. A number of its serovars are serious human pathogens. Intravenous therapy (IV) is a therapy that delivers liquid substances directly into a vein. The intravenous route of administration can be used for injections or infusions. Intravenous infusions are commonly referred to as drips. The intravenous route is the fastest way to deliver medications and fluid replacement throughout the body, because the circulation carries them. Intravenous therapy may be used for fluid replacement, to correct electrolyte imbalances, to deliver medications, and for blood transfusions. After a short incubation period of a few hours to one day, the bacteria multiply in the small intestine, causing an intestinal inflammation (enteritis). Most people with salmonellosis develop diarrhea, fever, vomiting, and abdominal cramps 12 to 72 hours after infection. Diarrhea is often watery and non-bloody but may be mucoid and bloody. In most cases, the illness lasts four to seven days, and does not require treatment. In some cases, though, the diarrhea may be so severe that the patient becomes dangerously dehydrated and must be hospitalized. At the hospital, the patient may receive fluids intravenously to treat the dehydration, and may be given medications to provide symptomatic relief, such as fever reduction. 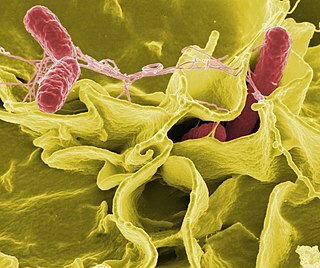 In severe cases, the Salmonella infection may spread from the intestines to the blood stream, and then to other body sites, and can cause death, unless the person is treated promptly with antibiotics. In otherwise healthy adults, the symptoms can be mild. Normally, no sepsis occurs, but it can occur exceptionally as a complication in the immunocompromised. However, in people at risk such as infants, small children, and the elderly, Salmonella infections can become very serious, leading to complications. In infants, dehydration can cause a state of severe toxicity. Extraintestinal localizations are possible, especially Salmonella meningitis in children, osteitis, etc. Children with sickle-cell anemia who are infected with Salmonella may develop osteomyelitis. Treatment of osteomyelitis, in this case, will be to use fluoroquinolones (ciprofloxacin, levofloxacin, etc., and nalidixic acid). Toxicity is the degree to which a chemical substance or a particular mixture of substances can damage an organism. Toxicity can refer to the effect on a whole organism, such as an animal, bacterium, or plant, as well as the effect on a substructure of the organism, such as a cell (cytotoxicity) or an organ such as the liver (hepatotoxicity). By extension, the word may be metaphorically used to describe toxic effects on larger and more complex groups, such as the family unit or society at large. Sometimes the word is more or less synonymous with poisoning in everyday usage. Salmonella bacteria can survive for some time without a host; they are frequently found in polluted water, with contamination from the excrement of carrier animals being particularly important. Nevertheless, such interior egg yolk contamination is theoretically unlikely. Even under natural conditions, the rate of infection was very small (0.6% in a study of naturally contaminated eggs  and 3.0% among artificially and heavily infected hens  ). Electrolytes may be replenished with oral rehydration supplements (typically containing salts sodium chloride and potassium chloride). Appropriate antibiotics, such as ceftriaxone, may be given to kill the bacteria, but are not necessary in most cases. 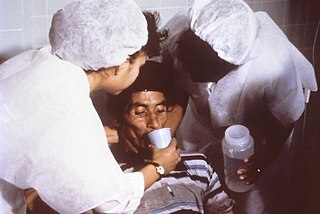 Azithromycin has been suggested to be better at treating typhoid in resistant populations than both fluoroquinolone drugs and ceftriaxone. There are recommendations on choice of antibiotic to avoid promoting antibiotic resistance. In Germany, food poisoning infections must be reported. Between 1990 and 2005, the number of officially recorded cases decreased from about 200,000 to about 50,000. In March 2007, around 150 people were diagnosed with salmonellosis after eating tainted food at a governor's reception in Krasnoyarsk, Russia. Over 1,500 people attended the ball on March 1 and fell ill as a consequence of ingesting Salmonella-tainted sandwiches. Both salmonellosis and the microorganism genus Salmonella derive their names from a modern Latin coining after Daniel E. Salmon (1850–1914), an American veterinary surgeon. He had help from Theobald Smith, and together they found the bacterium in pigs. The regulation was introduced, according to the FDA, "because of the public health impact of turtle-associated salmonellosis". Cases had been reported of young children placing small turtles in their mouths, which led to the size-based restriction. In cooking, coddled eggs are eggs that are gently or lightly cooked in water just below boiling temperature in or out of the shell or other container. They can be partially cooked, mostly cooked, or hardly cooked at all. Poached eggs are a type of coddled egg cooked in water. Egg white is the clear liquid contained within an egg. In chickens it is formed from the layers of secretions of the anterior section of the hen's oviduct during the passage of the egg. It forms around fertilized or unfertilized egg yolks. The primary natural purpose of egg white is to protect the yolk and provide additional nutrition for the growth of the embryo . Egg white consists primarily of about 90% water into which about 10% proteins are dissolved. Unlike the yolk, which is high in lipids (fats), egg white contains almost no fat, and carbohydrate content is less than 1%. Egg whites contain about 56% of the protein in the egg. Egg white has many uses in food and also many other uses. Foodborne illness is any illness resulting from the food spoilage of contaminated food, pathogenic bacteria, viruses, or parasites that contaminate food, as well as toxins such as poisonous mushrooms and various species of beans that have not been boiled for at least 10 minutes. Listeriosis is a bacterial infection most commonly caused by Listeria monocytogenes, although L. ivanovii and L. grayi have been reported in certain cases. Listeriosis can cause severe illness, including severe sepsis, meningitis, or encephalitis, sometimes resulting in lifelong harm and even death. Those at risk of severe illness are the elderly, unborn babies, newborns and those who are immunocompromised. In pregnant women it may cause stillbirth or spontaneous abortion, and preterm birth is common. Listeriosis may cause mild, self-limiting gastroenteritis and fever in anyone. 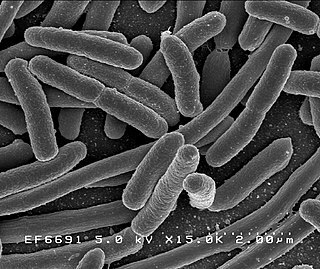 Exogenous bacteria are microorganisms introduced to closed biological systems from the external world. They exist in aquatic and terrestrial environments, as well as the atmosphere. Microorganisms in the external environment have existed on Earth for 3.5 billion years. Exogenous bacteria can be either benign or pathogenic. Pathogenic exogenous bacteria can enter a closed biological system and cause disease such as Cholera, which is induced by a waterborne microbe that infects the human intestine. Exogenous bacteria can be introduced into a closed ecosystem as well, and have mutualistic benefits for both the microbe and the host. A prominent example of this concept is bacterial flora, which consists of exogenous bacteria ingested and endogenously colonized during the early stages of life. Bacteria that are part of normal internal ecosystems, also known as bacterial flora, are called Endogenous Bacteria. A significant amount of prominent diseases are induced by exogenous bacteria such as gonorrhea, meningitis, tetanus, and syphilis. Pathogenic exogenous bacteria can enter a host via cutaneous transmission, inhalation, and consumption. Some eggs are laid by female animals of many different species, including birds, reptiles, amphibians, mammals, and fish, and have been eaten by humans for thousands of years. Bird and reptile eggs consist of a protective eggshell, albumen, and vitellus, contained within various thin membranes. The most commonly consumed eggs are chicken eggs. Other poultry eggs including those of duck and quail also are eaten. Fish eggs are called roe and caviar. Pasteurized eggs are eggs that have been pasteurized in order to reduce the risk of food-borne illness in dishes that are not cooked or are only lightly cooked. They may be sold as liquid egg products or pasteurized in the shell. Histomoniasis is a commercially important disease of poultry, particularly of chickens and turkeys, due to parasitic infection of a protozoan, Histomonas meleagridis. The protozoan is transmitted to the bird by the nematode parasite Heterakis gallinarum. H. meleagridis resides within the eggs of H. gallinarum, so birds ingest the parasites along with contaminated soil or food. Earthworms can also act as a paratenic host. In general, the United States alone experiences 1 million cases of salmonellosis per year. In Europe, although there are around 100,000 incidents of salmonellosis reported annually, there has been a steady decrease in cases over the past four years. The exact number of those infected is impossible to know as not all cases are reported. 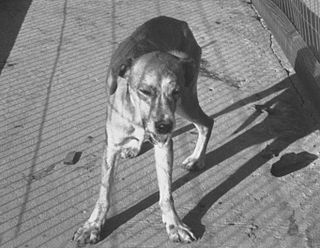 Of these reported cases, some can be classified as foodborne disease outbreaks by the Center for Disease Control and Prevention (CDC) if "two or more people get the same illness from the same contaminated food or drink" or zoonotic outbreaks if "two or more people get the same illness from the same pet or other animal". In 2012, the various strains or serotypes of the Salmonella bacteria, related to the outbreaks in the United States, infected over 1800 people and killed seven. In Europe, the European Centre for Disease Prevention and Control (ECDC) reported 91,034 cases of Salmonella infection with 65,317 cases related to the 2012 outbreaks. Of those 65,317 cases, there were 61 deaths. Salmonellosis annually causes, per CDC estimation, about 1.2 million illnesses, 23,000 hospitalizations, and 450 deaths in the United States every year. 1 2 3 4 5 6 7 8 9 10 11 12 13 14 15 16 "Salmonella". CDC. 9 March 2015. Archived from the original on 25 May 2017. Retrieved 7 May 2017. 1 2 3 4 Hald, T. (2013). Advances in microbial food safety: 2. Pathogen update: Salmonella. Elsevier Inc. Chapters. p. 2.2. ISBN 9780128089606. Archived from the original on 2017-09-10. 1 2 3 "Salmonella Infections". MedlinePlus. Archived from the original on 30 April 2017. Retrieved 7 May 2017. 1 2 3 4 5 6 7 8 9 10 "Salmonella (non-typhoidal)". World Health Organization. December 2016. Archived from the original on 20 April 2017. Retrieved 7 May 2017. 1 2 GBD 2015 Mortality and Causes of Death, Collaborators. (8 October 2016). "Global, regional, and national life expectancy, all-cause mortality, and cause-specific mortality for 249 causes of death, 1980-2015: a systematic analysis for the Global Burden of Disease Study 2015". Lancet. 388 (10053): 1459–1544. doi:10.1016/s0140-6736(16)31012-1. PMC 5388903 . PMID 27733281. ↑ "Salmonella". World Health Organization. Archived from the original on 17 April 2017. Retrieved 7 May 2017. 1 2 Santos, Renato L.; Shuping Zhang; Renee M. Tsolis; Robert A. Kingsley; L. Gary Adams; Adreas J. Baumler (2001). "Animal models od Salmonella infections: enteritis versus typhoid fever". Microbes and Infection. 3 (14–15): 1335–1344. doi:10.1016/s1286-4579(01)01495-2. ↑ "Nontyphoidal Salmonella Infections - Infectious Diseases - Merck Manuals Professional Edition". Merck Manuals Professional Edition. Retrieved 2018-09-15. ↑ "What is Salmonellosis?". US Center of Disease Control and Prevention. Archived from the original on 2014-03-31. ↑ Smith, JL; Bayles, D (July 2007). "Postinfectious irritable bowel syndrome: a long-term consequence of bacterial gastroenteritis". Journal of Food Protection. 70 (7): 1762–9. doi:10.4315/0362-028X-70.7.1762. PMID 17685356. 1 2 Mann, EA; Saeed, SA (January 2012). "Gastrointestinal infection as a trigger for inflammatory bowel disease". Current Opinion in Gastroenterology. 28 (1): 24–9. doi:10.1097/mog.0b013e32834c453e. PMID 22080823. ↑ Schmitt, SK (November 2017). "Reactive Arthritis". Infectious Disease Clinics of North America (Review). 31 (2): 265–77. doi:10.1016/j.idc.2017.01.002. PMID 28292540. ↑ Cook, Bruce A.; Md, James W. Bass; Burnett, Mark W. (1998-02-01). "Etiology of Osteomyelitis Complicating Sickle Cell Disease". Pediatrics. 101 (2): 296–297. doi:10.1542/peds.101.2.296. ISSN 0031-4005. PMID 9445507. 1 2 "Nontyphoidal Salmonella Infections". Merck Manual. Archived from the original on 2016-09-19. Retrieved 2016-09-19. ↑ Jeanne Goldberg (24 February 2012). "Are the bacteria that make food smell and taste bad the same ones that make you sick?". Tufts.edu. Retrieved 28 May 2018. ↑ "Reptile-Associated Salmonellosis—Selected States, 1998–2002". Centers for Disease Control and Prevention. 12 December 2003. Archived from the original on 6 October 2011. Retrieved 9 October 2011. ↑ Mermin J, Hoar B, Angulo FJ (March 1997). "Iguanas and Salmonella marina infection in children: a reflection of the increasing incidence of reptile-associated salmonellosis in the United States". Pediatrics. 99 (3): 399–402. doi:10.1542/peds.99.3.399. PMID 9041295. ↑ "Ongoing investigation into reptile associated salmonella infections". Health Protection Report. 3 (14). 9 April 2009. Archived from the original on 29 April 2009. Retrieved 12 April 2009. ↑ "Multi-country outbreak of Salmonella Stanley infections Update". EFSA Journal. 10 (9): 2893. 21 September 2012. doi:10.2903/j.efsa.2012.2893. ↑ "Playing It Safe With Eggs". FDA Food Facts. 2013-02-28. Archived from the original on 2013-03-01. Retrieved 2013-03-02. The U.S. Food and Drug Administration (FDA) estimates that 142,000 illnesses each year are caused by consuming eggs contaminated with Salmonella. 1 2 Black, Jane; O'Keefe, Ed (2009-07-08). "Administration Urged to Boost Food Safety Efforts". Washington Post . Archived from the original on 2011-06-04. Retrieved 2009-07-07. Among them is a final rule, issued by the FDA, to reduce the contamination in eggs. About 142,000 Americans are infected each year with Salmonella enteritidis from eggs, the result of an infected hen passing along the bacterium. About 30 die. ↑ Humphrey, T. J. (January 1994). "Contamination of egg shell and contents with Salmonella enteritidis: a review". International Journal of Food Microbiology. 21 (1–2): 31–40. doi:10.1016/0168-1605(94)90197-X. PMID 8155476. Archived from the original on 2013-02-02. Retrieved 2010-08-19. Salmonella enteritidis can contaminate the contents of clean, intact shell eggs as a result of infections of the reproductive tissue of laying hens. The principal site of infection appears to be the upper oviduct. In egg contents, the most important contamination sites are the outside of the vitelline membrane or the albumen surrounding it. In fresh eggs, only a few salmonellae are present. As albumen is an iron-restricted environment, growth only occurs with storage-related changes to vitelline membrane permeability, which allows salmonellae to invade yolk contents. ↑ Stokes, J.L. ; W.W. Osborne; H.G. Bayne (September 1956). "Penetration and Growth of Salmonella in Shell Eggs". Journal of Food Science. 21 (5): 510–518. doi:10.1111/j.1365-2621.1956.tb16950.x. Normally, the oviduct of the hen is sterile and therefore the shell and internal contents of the egg are also free of microorganisms (10,16). In some instances, however, the ovaries and oviduct may be infected with Salmonella and these may be deposited inside the egg (12). More frequently, however, the egg becomes contaminated after it is laid. ↑ Okamura, Masashi; Yuka Kamijima; Tadashi Miyamoto; Hiroyuki Tani; Kazumi Sasai; Eiichiroh Baba (2001). "Differences Among Six Salmonella Serovars in Abilities to Colonize Reproductive Organs and to Contaminate Egges in Laying Hens". Avian Diseases. 45 (1): 61–69. doi:10.2307/1593012. JSTOR 1593012. PMID 11332500. when hens were artificially infected to test for transmission rate to yolks: "Mature laying hens were inoculated intravenously with 106 colony-forming units of Salmonella enteritidis, Salmonella typhimurium, Salmonella infantis, Salmonella hadar, Salmonella heidelberg, or Salmonella montevideo to cause the systemic infection. Salmonella Enteritidis was recovered from three yolks of the laid eggs (7.0%), suggesting egg contamination from the transovarian transmission of S. enteritidis." ↑ Gast, RK; D.R. Jones; K.E. Anderson; R. Guraya; J. Guard; P.S. Holt (August 2010). "In vitro penetration of Salmonella enteritidis through yolk membranes of eggs from 6 genetically distinct commercial lines of laying hens". Poultry Science. 89 (8): 1732–1736. doi:10.3382/ps.2009-00440. PMID 20634530. Archived from the original on 2011-07-24. Retrieved 2010-08-20. In this study, egg yolks were infected at the surface of the yolk (vitelline membrane) to determine the percentage of yolk contamination (a measure used to determine egg contamination resistance, with numbers lower than 95% indicating increasing resistance): Overall, the frequency of penetration of Salmonella Enteritidis into the yolk contents of eggs from individual lines of hens ranged from 30 to 58% and the mean concentration of Salmonella Enteritidis in yolk contents after incubation ranged from 0.8 to 2.0 log10 cfu/mL. ↑ Humphrey, T.J.; A. Whitehead; A. H. L. Gawler; A. Henley; B. Rowe (1991). "Numbers of Salmonella enteritidis in the contents of naturally contaminated hens' eggs". Epidemiology and Infection. 106 (3): 489–496. doi:10.1017/S0950268800067546. PMC 2271858 . PMID 2050203. Archived from the original on 2012-10-21. Retrieved 2010-08-19. Over 5700 hens eggs from 15 flocks naturally infected with Salmonella enteritidis were examined individually for the presence of the organism in either egg contents or on shells. Thirty-two eggs (0·6%) were positive in the contents. In the majority, levels of contamination were low. ↑ Gast, Richard; Rupa Guraya; Jean Guard; Peter Holt; Randle Moore (March 2007). "Colonization of specific regions of the reproductive tract and deposition at different locations inside eggs laid by hens infected with Salmonella Enteritidis or Salmonella Heidelberg". Journal of Avian Diseases. 51 (1): 40–44. doi:10.1637/0005-2086(2007)051[0040:cosrot]2.0.co;2. PMID 17461265. Archived from the original on 2010-03-10. Retrieved 2010-08-20. when hens are artificially infected with unrealistically large doses (according to the author): In the present study, groups of laying hens were experimentally infected with large oral doses of Salmonella Heidelberg, Salmonella Enteritidis phage type 13a, or Salmonella Enteritidis phage type 14b. For all of these isolates, the overall frequency of ovarian colonization (34.0%) was significantly higher than the frequency of recovery from either the upper (22.9%) or lower (18.1%) regions of the oviduct. No significant differences were observed between the frequencies of Salmonella isolation from egg yolk and albumen (4.0% and 3.3%, respectively). ↑ "Salmonella Questions and Answers". USDA Food Safety and Inspection Service. 2006-09-20. Archived from the original on 2009-01-15. Retrieved 2009-01-21. ↑ "FDA issues peanut safety guidelines for foodmakers". Reuters. 2009-03-10. Archived from the original on 2009-03-12. ↑ MacLennan CA, Gondwe EN, Msefula CL, et al. (April 2008). "The neglected role of antibody in protection against bacteremia caused by nontyphoidal strains of Salmonella in African children". J. Clin. Invest. 118 (4): 1553–62. doi:10.1172/JCI33998. PMC 2268878 . PMID 18357343. ↑ Nandre, Rahul M.; Lee, John Hwa (Jan 2014). "Construction of a recombinant-attenuated Salmonella Enteritidis strain secreting Escherichia coli heat-labile enterotoxin B subunit protein and its immunogenicity and protection efficacy against salmonellosis in chickens". Vaccine. 32 (2): 425–431. doi:10.1016/j.vaccine.2013.10.054. PMID 24176491. ↑ Neuman, William (2010-08-24). "U.S. Forgoes Salmonella Vaccine for Egg Safety". The New York Times. ISSN 0362-4331. Archived from the original on 2016-04-17. Retrieved 2016-03-12. 1 2 "Contaminated chicken: After illnesses soar, Denmark attacks salmonella at its source". Archived from the original on 2015-06-09. Retrieved 2016-09-18. ↑ Cummings, PL; Sorvillo F; Kuo T (November 2010). "Salmonellosis-related mortality in the United States, 1990–2006". Foodborne Pathogens and Disease. 7 (11): 1393–9. doi:10.1089/fpd.2010.0588. PMID 20617938. ↑ Burros, Marian (March 8, 2006). "More Salmonella Is Reported in Chickens". The New York Times. Archived from the original on January 9, 2016. Retrieved 2007-05-13. 1 2 3 "Salmonella Lurks From Farm to Fork « News21 2011 National Project". foodsafety.news21.com. Archived from the original on 2016-06-02. Retrieved 2016-09-18. ↑ "Ground Turkey Recall Shows We Still Need Kevin's Law | Food Safety News". 2011-08-12. Archived from the original on 2016-10-09. Retrieved 2016-09-18. ↑ Veelgestelde vragen Salmonella Thompson 15 oktober 2012, Rijksinstituut voor Volksgezondheid en Milieu [Frequently asked questions Salmonella Thompson 15 October 2012, Netherlands Institute for Public Health and the Environment]. ↑ "Salmonella besmetting neemt verder af, 2 november 2012, Rijksinstituut voor Volksgezondheid en Milieu" [Salmonella infections continue to decline 2 November 2012, Netherlands Institute for Public Healthand the Environment]. ↑ Hong, Lynda (7 December 2007). "PrimaDeli food poisoning cases increase to 153". Channel NewsAsia. Archived from the original on 8 December 2007. ↑ Vågene, Åshild J.; Herbig, Alexander; Campana, Michael G.; Robles García, Nelly M.; Warinner, Christina; Sabin, Susanna; Spyrou, Maria A.; Andrades Valtueña, Aida; Huson, Daniel; Tuross, Noreen; Bos, Kirsten I.; Krause, Johannes (2018). "Salmonella enterica genomes from victims of a major sixteenth-century epidemic in Mexico". Nature Ecology & Evolution. 2 (3): 520–528. doi:10.1038/s41559-017-0446-6. ISSN 2397-334X. PMID 29335577. ↑ "Human Health Hazards Associated with Turtles". U.S. Food and Drug Administration. Archived from the original on 2007-06-09. Retrieved 2007-06-29. Wikimedia Commons has media related to Salmonella .